KOTA BARU: Kelantan lost an influential leader yesterday with the passing of Datuk Bentara Setia Nik Abdul Aziz Nik Mat at the age of 84. The former Kelantan menteri besar died at 9.45pm, an hour after he was sent home to Kota Baru after doctors took him off respiratory support at Hospital Universiti Sains Malaysia (HUSM) in Kubang Kerian. “His health deteriorated after the doctors treated the ulcer last night [Wednesday],” his son Nik Mohamad Abduh Nik Abdul Aziz had said earlier in a statement. Among those who gathered at his house in Pulau Melaka last night were PAS vice-president Datuk Paduka Husam Musa, who confirmed his death to The Malaysian Insider. 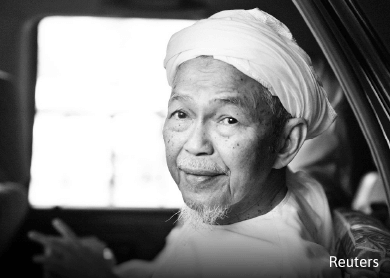 Nik Aziz was the longest-serving Kelantan menteri besar, from 1990 to 2013 and was the PAS spiritual leader from 1991. Nik Aziz had been the strongest advocate of the Pakatan Rakyat alliance since its formation in 2008, and also rejected all possibilities of PAS cooperating with Umno. He was the most respected leader among his colleagues in Pakatan components DAP and PKR, including opposition leader Datuk Seri Anwar Ibrahim. Anwar often flew to Nik Aziz’s home in Pulau Melaka to consult the leader before major decisions or to discuss internal problems. He also earned the trust of non-Muslims nationwide, and, among others, supported their right to use the word “Allah” as long as they have no ill intentions. Born on Jan 10, 1931, Nik Aziz obtained his early education from his own father, who was a religious teacher. He continued his studies in Darul Uloom Deoband, Uttar Pradesh, India, majoring in the Arabic language. After earning his first degree, Nik Aziz pursued his postgraduate studies in Al Azhar Univesity, Egypt, and graduated with a Master of Arts in Islamic Jurisprudence. Upon his return to Malaysia, he worked as a religious teacher and contested in his first general election in 1967, the same year he joined PAS. He won the Kelantan Hilir parliamentary seat (later renamed to Pengkalan Chepa) and retained the seat until 1986. Nik Aziz was appointed the Kelantan PAS commissioner in 1978 after the party lost the state. He and then-PAS president Tan Sri Dr Mohd Asri Muda did not see eye-to-eye, and the latter resigned the same year. Nik Aziz first contested a state seat in 1986. He was appointed the Kelantan menteri besar after PAS won the state in 1990. Nik Aziz stepped down as Kelantan menteri besar on May 6, 2013, despite winning the Chempaka state seat in the 13th general election.